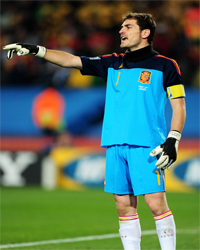 Spain captain Iker Casillas insisted his side were superior throughout their World Cup semi-final win over Germany in Durban. Veteran Barcelona defender Carles Puyol made the breakthrough 73 minutes into the tightly fought contest to send Spain into their first ever World Cup final. "We're very happy. It is the last but most beautiful game, and we will enjoy the final," Casillas was quoted as saying by AS, before noting he was glad that their opponents allowed Spain to play. "We were superior because we have controlled them from set pieces and we have even scored from a corner. Germany let us play." When asked about why Spain have not delivered more goals at the finals, winning each knock-out round by a solitary goal, Casillas said that people are spoiled by Spain's success and the results should be put into context. "We have spoiled the people, we must give the games the relative importance, and we played against big rivals such as Portugal and Germany," he noted.